This is my 100th Deviation! I thought it would be a good idea to showcase my entire collection of Disney designs! Now I'm in no way finished, but with reaching such an awesome milestone, I thought I would share with you what's gotten me so popular with you weirdos! For those seeing this for the first time, yes this is real make-up! Now tell me, what Disney movie do you want to see next? EEE! Thank you so much for the Daily Deviation! Writing this I realize two things. First skin and make up are can be difficult and detailing becomes an issue. Second my items may seem nit-picky. Tangled: The floating lanterns seemed too free form. Would there be a technique or trick for you to make them more uniform in shape while still showing the proper depth of the image. Aladdin: Pigment of Genie seems to appear too green however that could just be the image and not how it actually appears on the eyelid. The face of the Cave of Wonders seems stretched vertically. Beauty and the Beast: As the magic flower is encased in glass, the railing of the balcony would show through even just slightly. Alternative: add more of the flowers glow within the glass dome. The Nightmare Before Christmas: I can not properly describe it right now however Jack's legs look off, as though they do not fit with his anatomy. 81 out of 105 deviants thought this was fair. I absolutely love your work, I can't possibly critique it because i've no experience in work such as this. The colours you use, just by looking at them in thumbnail preview they look so magical. Can't wait too see more of your work ^^ you must be an inspiration for makeup artists, it's really creative. 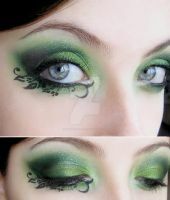 I've actually never seen work as brilliant on the eyelids as this before. 53 out of 57 deviants thought this was fair. Nightmare before christmas was made by disney? Its AMAZING!!! AMAZING WORK!!! PERFECT!!! Ahaha u missed one FROZEN of course most obliterating obvious ( at no offence to you ) anyways you are AMAZING!!!!!!!! Whoa this is nice! It's amazing all the things you can do with makeup. Have to suggest Sleeping Beauty since she's the one I was named after. Hey, I love you're makeup!! I was wondering what brand of makeup you use? This must have taken a really steady head! I admire this so much! Ive seen this all over the internet and it still amazes me! You are SO talented!! Not yet, I tried it last year but it didn't turn out well. Found some of your work featured here! Oh! Thanks for letting me know!